A program was organized for 28 undergraduates from 10 colleges of Hubli/ Dharwad/ Chikodi/ Sirsi/ Bijapur/ Jamkhandi region. From June 7th to June 16th, 2014 students participated in the Deshpande Foundation’s LEAD Leadership Program. LLP aims to help students become strong leaders through practical exposure to an array of subjects, site visits, and guest speaker sessions. The Program began with sharing expectations from LLP, framing committees, grouping, ice breaking and self introduction of participants. 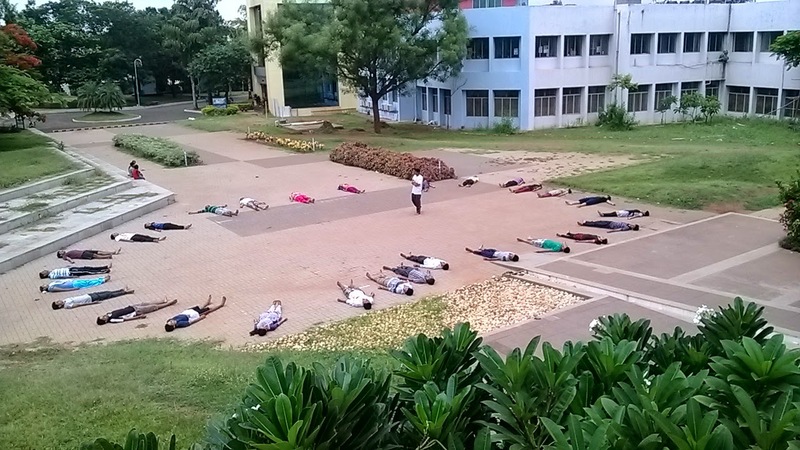 Day use to begin with Warming up exercise and Yoga session in the morning by 6’0 Clock by Mr.Chandrashekar,Facilitator. On 16th June Mr. Vivek Pawar, CEO, Sankalp Semi Conductor engaged session on Yoga and interacted with young minds which inspired them about his perspective success and leadership. Students have prepared 3 D model on rain water harvesting ,protection of historical monuments, LEAD tower during the ice breaking session. In next session a platform was created to Students to think out of box, be creative and present using stage. Students were themselves amazed for idea presenting in the form of skit, drama and mime by given key words like Clock, water, pen, Bullock cart, cat and Newspaper. The sessions were continued by business plan presentation in KSV. Students were given divided into teams and asked to present their innovative and creative product launch like cooling cap, insect trapper, organic farming, multi solar device etc. At the end of the program students made best of waste models like paintings on used glass bottles, warli art, pictures,craft out of reuse plastic bottles etc and displayed them in creative corner in closing ceremony. Most excited part was My story sharing by Rajan Patel, Stanford University, this gave a platform for exchange of thoughts on education, culture, life style, passion and motivation. At Stanford, he founded and led several student groups on design, engineering, and innovation in addition to being an active tutor to students in the community. His passion to build things and empower people to be makers and problem solvers themselves has persisted and grown ever since. First session was handled by Mrs. Neelam Maheshwari, Director of GRANTS, Deshpande Foundation shared her experience and expressed about working on things which really makes us happy. Her motivational words made release about Gender. Madam is the real role model for youths to prove their ability. She inspired girl students to work equally to men. Next Most exciting part was interactive session with Mr. Naveen, CEO, Deshpande Foundation. He expressed students to be a positive thinker, double up energy with new thoughts everyday. His view on Leadership – Leadership is a initiative to start up an idea with value based, then it builds leadership quality step by step which will lead to move ahead in venture. Leaders also interacted with Jenelle Sobey, Social Innovation Manager, Pond Deshpande Centre Canada about Social Innovation and Pond Deshpande Centre activities. Development Dialogue speaker, Mr Shankar Gouda created a good platform to have a interactive session on organic farming. Micro Entrepreneur Mr. Irranna Hombalemath engaged a session on Business development. And shared his story of successful business. Media content writing session was handled by Sanjeev Kulkarni, Program Manager he shared procedure of Press release and letter to editor. Media and Digital Photography workshop was handled by Gaurav Pandey.Knowing myself by doing something topic was covered by Mr.Prashant Deshpande and students enjoyed group activities. Active leaders shared their LEAD journey–Mr.Aarya ,YS 2014 Project awardee ,Social Media Intern expressed his personal and his team growth and Leader Asha sharing her Entrepreneur journey of Asha Enterprises.The day ended by leader sharing from Naveen, YS 2014 awardee of Ground water recharge project. Mr.Vikram Patil engaged session on Leadership students got to know Who is Leader? Where Leadership starts? What is Leadership? Mental model from DAC module, activities and 6 LEADership approaches i.e Affiliative, Visionary, Coaching, Directive, Collaborative, Pacesetting.Miss.Geeta Hegde engaged session on Social identity and at last with team building activities to understand the individual behavior/Team behavior. Sessions started with activities on communication skills by Mrs Aditi and followed by IT Session. Students were given an opportunity to create Email id ,effective email. Dos and Donts of email writing. Resume writing and its importance. The sessions ended in submitting resume in soft copy through the same email which was created in the morning. She stressed more on body of email content and effective resume writing. Students learned and practiced many important skills that will benefit them in their personal and professional development. In their IT sessions, students learned how to create accounts and effectively use sites such as Facebook and Gmail. Students also learned about important computer programs like as Microsoft Word , Flyer designing. During the camp, students encounter a variety of hands-on activities, in-depth readings, personal reflections, group discussions, and opportunities to have your own adventurous experiences. At the end of the camp.They were able to Understand how groups develop and what you could do when, in order to make experiences more meaningful and Know more about what drives learning, the elements that support it, and what you could do to make experiences more joyful, and managing emotions – the gateway to learning. Students tasted the energizer like passing the baloon and Juguja. Birthday line up and Key punch, Pipe and Marble,The big puzzle and Structure -Team Building activities were engaged by Mrs.Deepashree Ram Mohan,Program Manager and Mr.Vikram Patil,Program Co ordinator. LEADers visited Akshay Patra and witnessed Asia’s Biggest kitchen and they were given an opportunity to taste the food prepared. Then later moved their visit to Agasyta International Foundation,that made them really inspire by sparking creativity in preparing low cost science models.Next visited BAIF. Both the farmers explained their achievements with BAIF support about the processes involved in changing the dry and unproductive land into lush green and productive wadi. Visitors are much impressed with the tree based farming system. They understood the concept of soil and water conservation, incorporation of trees with crops, fodder on bunds and integration of livestock to increase the land fertility and income through milk. Visitors are convinced about the recycling of nutrients in wadi mode.On the way to Deshpande foundation campus leaders visited Rain water harvesting model near Shiggoon. The program began by 5:00 PM on 16th June in presence of Mr.Rajan Patel, Stanford University and Mr. Ajay Suman Shukla, Functional Head,LEAD .Leader Bhagyashree welcomed the gathering followed by welcome song by Laxmi. During the program students shared their learning experience. Students performed Bharatnatyam ,Kathakalli and Sitar Musical instrument which they have learn’t during their visit to Kalakeri Sangeeth Vidyalaya. At last program ended by certificate distribution and cake cutting ceremony.MOC was handled by Priyanshi and Rohit. Leader Akshatha of Sirsi says she is inspired by sessions and exposure visits which have made her open up and increase her confidence level. She wanted to take many more projects in LEAD and prove her LEAD journey. Leader Pramod of Chikodi, LLP Student co coordinator who attended LLP for second time was much inspired by functioning of LEAD he shared his LEAD journey and expressed about future plan in LEAD as a Intern and transform leadership in Raibag,Harugeri and Ankali. The first participant Bhagyashree says “Today is a most exciting day to meet new friends, learn new things and to explore LEAD program”.A leader who never opened at college was able to deliver welcome speech in closing ceremony. LEADer Manoj started up with his own company producing Anti Plastic Bags.